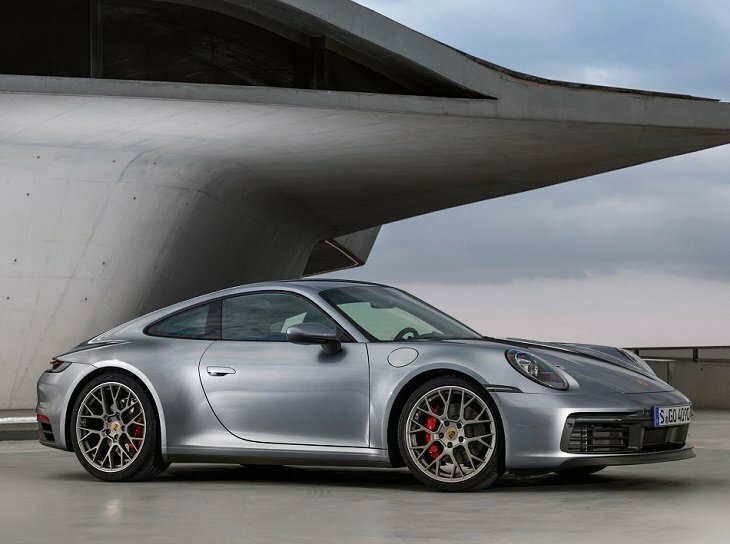 Twin-turbocharged flat-six making 443 hp, 390 lb.-ft.
With the redesigned 2020 Porsche 911, the automaker updates the car’s design and engineering, safety and technology, and, of course, its performance. Officially revealed in one of Porsche’s most important markets, Southern California, the new 911 debuted in Carrera S and 4S specification at the 2018 Los Angeles Auto Show. Three key changes are made to the new 911’s exterior design. First, all Carreras get the wide-body appearance formerly reserved for selected models, with 20-inch front and 21-inch rear wheels tucked under the swollen fenders of the Carrera S and 4S. Second, the bodywork is aluminum in order to save weight, and the hood gets a classic design cue from the original 911: a recess starting just forward of the windshield and blending into the front luggage compartment cover. Third, new LED headlights echo the upright and round shape of 911s of the past, while a full-width rear LED light bar mimics the appearance of all modern Porsches. If there is controversy to come with regard to the 2020 911, it is likely related to this design cue. Aside from these changes, Porsche also employs new flush-mount door handles that extend when needed, reshaped side mirrors that reduce wind noise, and a wider variable position rear spoiler. Porsche says the new car’s interior is inspired by 911 models of the 1970s, with straight horizontal lines and recessed instrumentation. As is tradition, ancillary gauges flank a large center-mount analog tachometer. In the new 911, the secondary gauges are actually freeform displays conveying various data to the driver. In the center of the layered dashboard, five toggle switches underscore a new widescreen Porsche Communication Management (PCM) infotainment system. These switches provide fast and easy access to drivetrain and chassis settings. The car’s center control panel is separate from the dashboard, and now includes a minimum number of controls for the sake of simplicity. Dual-zone automatic climate control is standard, with an air ionizer offered as an upgrade. Redesigned seats offer greater comfort, according to Porsche. Upgraded 18-way Sport Seats Plus remains an option for the Carrera S and 4S, now supplying improved lateral support at the shoulders. Drivers face a multi-function steering wheel supplying quick access to audio, phone, navigation, and voice command functions. Porsche says that the 2020 911 Carrera S and 4S are more powerful, and more efficient. Power flows from next-generation twin-turbocharged flat-six engines, and in the new 911 Carrera S the motor is making 443 horsepower at 6,500 rpm, and 390 lb.-ft. of torque between 2,300 rpm and 5,000 rpm. A new 8-speed Porsche Doppelkupplung (PDK) dual-clutch transmission put the power to the rear (911 Carrera S) or all four wheels (911 Carrera 4S). Porsche Torque Vectoring Plus (PTV Plus) remains an upgrade, and the automaker says a manual gearbox is coming soon, but will not be available when the car goes on sale. Based on Porsche’s claims, the 911 Carrera S accelerates to 60 mph in 3.3 seconds with the available Sport Chrono Package and boasts a top speed of 191 mph. The 911 Carrera 4S is not as fast, but the estimated differences will prove indiscernible from the driver’s seat. Porsche also says that it has re-tuned the 911’s Porsche Active Suspension Management (PASM) system for improved ride and handling characteristics. A sport version of PASM is available, dropping the car’s ride height by 10 mm. Porsche Dynamic Chassis Control (PDCC) is optional, helping to minimize body roll and lateral body motions. Yellow brake calipers signal another dynamic upgrade in the form of Porsche Ceramic Composite Brakes (PCCB), an expensive option but necessary if you intend to drive a 911 Carrera in the manner for which it is intended. Standard safety features of the new 911 include forward collision warning, brake assist, and automatic emergency braking. Options include adaptive cruise control with stop-and-go capability and automatic distance control, lane keeping assist, road sign recognition, and emergency assist technology. New features include a standard Porsche Wet Mode, which detects water on the road surface and pre-conditions the stability control and braking systems for optimum performance in the rain. Porsche will offer new LED-Matrix headlights for the 2020 911, complete with Porsche Dynamic Light System Plus (PDLS Plus) and automatic high-beam assist. A Night Vision Assist system with thermal imaging is also new for the redesigned 911. If certain elements of the 2020 911 are inspired by the 1970s, the car’s new Porsche Communication Management (PCM) infotainment system architecture and interface clearly point the way to the future. Upgrades make the system faster to respond to input and more intuitive to use, and with the larger 10.9-inch touchscreen display drivers can easier reference information. The system includes Porsche Connect Plus subscription services, which is free for the first 12 months, and which offers new swarm traffic data capability. Additional options for the new 911 include a Burmester high-end surround sound audio system and Park Assist with Surround View, which makes it easier to maneuver the car in cramped quarters.